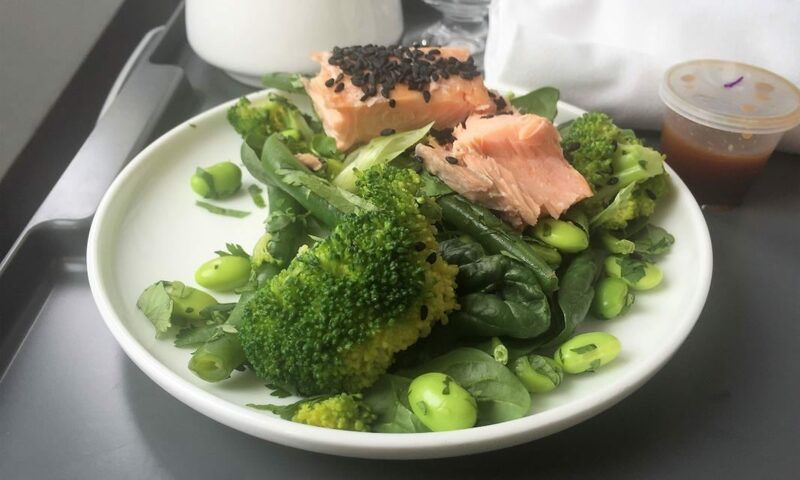 It is interesting to see what airlines offer in business class when it comes to food, so here is a battle between three airlines showing their business class meal offering on flights under 2 hours. In Europe, it is British Airways Club Europe and KLM Europe Business Class. Heading down under, we have the offering of Australia’s Qantas as a comparison. These meals were all served in March and April of 2017. Opening the battle are our friends at KLM. This is the oldest airline in the world and my first flight with them ever was earlier this year. You get a sandwich for lunch and it comes with crisps, dessert and a salad. I really like how this meal can be divided into courses. Salad, the sandwich, dessert and then you can snack on the crisps for the rest of the flight. The presentation in a cardboard box is not particularly premium, but the contents gain no shame. Next up in our battle is the new British Airways Club Europe lunch catering which I experienced on the first day it was introduced. The hot option is a beef ciabatta (which now comes with a very light fruit salad on the empty plate) plus a dessert. While it is a lot of bread it does taste quite nice. They now cut it in half which makes it easier to manage. For those choosing the cold option, you had better not be too hungry because the salad would politely be described as sparse. Despite the fact the meal is best termed light, there is no questions around the quality or taste. It is very nice indeed and is great for those who wish to keep healthy. More of it would be good though! The final meal in our three way battle is that offered by Australia’s Qantas. My flight was on the Boeing 717 which is the smallest Boeing commercial aircraft in service today. This is also a cold option and the salad and greens are very tasty and perfect for a short flight. You get good presentation plus a healthy meal all on one airline tray. Nothing at all wrong with this meal either! As with everything, it probably comes down to personal taste. If you think a hot meal is a must in business class then British Airways and the ciabatta would win. Are you a sandwich lover? You can’t go past the KLM club sandwich which is filling, tasty and has a different taste each time you take another bite. You may be into salads and if that is the case Qantas would trump British Airways in this instance. Qantas offer a meal that does not come across as parsimonious. When it comes to Champagne, British Airways Castelnau is the best while KLM’s offering of Cava is easily the worst. The Qantas Champagne is fine too, but not a winner. Dessert fans are out of luck on Qantas as there isn’t one. The KLM dessert is much better than the British Airways one – both are similar in size but the cheesecake is far nicer than the gloopy pot of something that BA serve. Sure, it’s all relative but it is interesting to see what is offered on three different airlines right now. Airlines in the United States generally offer nothing but drinks on short sectors in their first class cabin. This cabin is the same as other airlines domestic business class, so it amazes me that people just accept no food when paying so much extra. My pick in this list would be elements of each. I’d take the British Airways salad to start, the KLM Club Sandwich on the side and the Qantas salad for my main course, finishing with the KLM dessert. Naturally, the BA champagne to wash it all down. Thank you for reading and if you have any comments or questions, please leave them below. 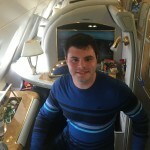 NextAir China Business class fares under $1500!! I’m flying BA on Business from Budapest to Southampton shortly. I believe it’s under 2 hours so I’ll keep you posted!